Sometimes “rabbit food” is what you want for dinner. Two of the salad’s components can be made ahead — the Roseval potato chips and the roasted shallots. The prep time listed below does not take the prep time of either of these two elements into account. Roseval is an heirloom fingerling potato, originally from France. This potato has a reddish peel, and a pale ivory and pink-toned flesh. It develops a robust, buttery flavor when cooked and is especially delicious roasted, sautéed or in salads. Substitute Russian Banana or La Ratte fingerling potatoes if unavailable. Heat peanut oil in a large skillet over medium-high heat. Add sliced potatoes to the pan. Fry until potatoes are golden brown; do not burn. Remove from heat and lay atop a paper towel-lined plate. Taste for salt and pepper, then sprinkle potato chips with a couple of teaspoons sherry vinegar or malt vinegar. Set aside until needed. Place shallots in a small bowl. Add 1 tablespoon olive oil, a small pinch of salt and half that amount of black pepper, and the sherry vinegar. Mix well, then spoon onto a roasting pan or glass Pyrex baking dish. Roast at 350 F for 20 minutes or until shallots have become meltingly tender and soft. Remove from heat and let cool. Slice each shallot in half, and set aside until needed. Bring a pot of water to a roiling boil. Add egg and cook, about 12 to 15 minutes; cooking time will vary and is dependent on the freshness of the egg. Let cool, then peel and slice into wedges. In a small bowl, whisk together the extra-virgin olive oil and lemon juice. Taste for salt and pepper. Stir in the minced herbs. Drizzle a tablespoon of dressing onto the salad greens. 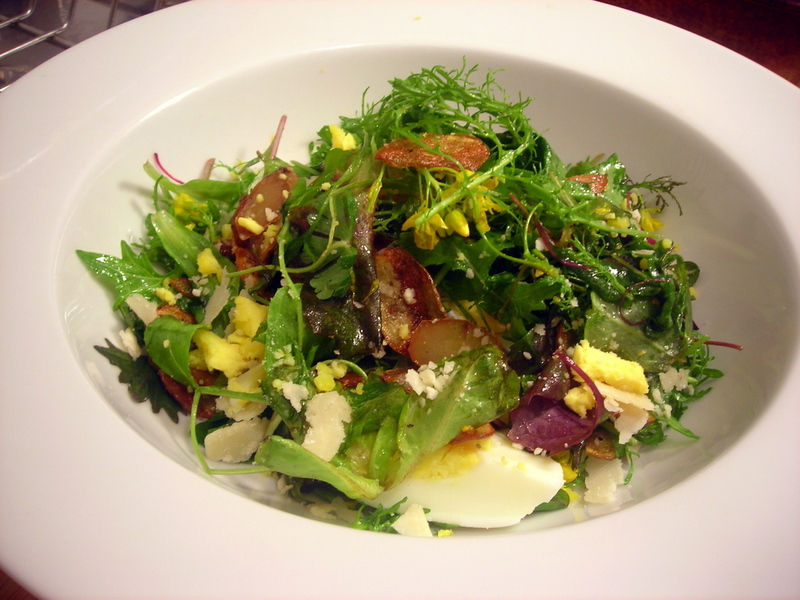 Toss, to ensure that the greens are lightly dressed with the vinaigrette. Combine the potato chips, roasted shallots and salad greens. Gently toss together. Spoon salad onto a salad plate or into a wide, shallow bowl. Top each serving with a hard-cooked egg and some shaved Parmigiano-Reggiano cheese, then serve at once. Time: About 30 minutes, not counting prep of the potato chips and roasted shallots. This is my entry for Souper (Soup, Salad and Sammie) Sundays for the week of April 2, 2012 to April 8, 2012, a weekly foodblogging event organized and hosted by Deb of Kahakai Kitchen. 04 Apr	This entry was published on April 4, 2012 at 2:07 am. It’s filed under American cuisine, cooking, food, food photography, recipe, Souper (Soup, Salad & Sammie ) Sundays, spring, vegetarian and tagged dinner, food photography, gluten-free, lettuce, potatoes, salad, vegetarian. Bookmark the permalink. Follow any comments here with the RSS feed for this post. This salad just looks scrumptious! Third try on the comment…Lovely salad — especially the fingerlings! I have it set to comment moderation so I can avoid flames and spam-filled comments (ironic, no? for a blog that has “spam” in the title). I had thought initially that my settings changed inadvertently to require that a commenter needed to be logged in prior to posting a comment but that does not seem to be the case. You may want to alert the WordPress staff in case your experience was a fluke. It’s a great salad, I agree, and one I’ll be making again. Thanks for stopping by!